This is my favorite work of art in my home. The child’s face is full of receptivity and joy, and the mother looks at her child with delight. They are truly connected. That painting reminds me not only of my joy in parenting my own three children but also reminds me of the joy I found in helping adolescents in my classes to fall in love with reading literature and being a writer. The painting speaks to me of nurturing. 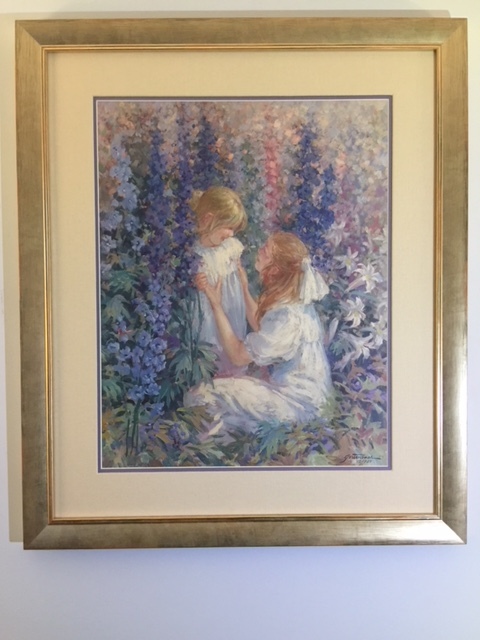 The painting speaks to me of the deep value of the kind of connection in which adults foster growth in children and delight in doing it. The continued gun violence visited upon America’s schools and school children, along with the abject failure of the adults who run the country to do anything about it, leads me to one inescapable conclusion: In the United States of America, we don’t care about our children. When I say “our children” here, I am referring to children in general, not individual children. As the grieving parents in Florida today will attest, we all care about our own children. What we do not seem to care about is all the other children. I urge you to read the whole of Russ Walsh’s piece. The three statistics he quotes will convince you of how our nation has not cared for our children. . The only way to explain the lack of action on gun violence in the schools is that we value our right to bear arms more than we value our children. Politicians seem to be unable to even have a conversation about bringing gun proliferation under control. Our founding fathers, I am sure, did not mean for the second amendment to require that we were to remain impotent in protecting our children from guns in the hands of society’s disaffected. Surely. “life, liberty, and the pursuit of happiness” means freedom from fear of being shot in your own classroom. Surely the right to bear arms is a limited right, just as every other right enumerated in the Bill of Rights is limited by the simple fact that the unfettered exercise of that right could endanger others. So we have no right to cry, “Fire!” in a crowded theater and no right to refuse to wear a seat belt and we have even decided to give up the right to smoke in public places. Surely we can all do without the right to carry an AR-15 around with us. It’s time. In fact, it’s more than time; it’s way, way, way overdue. It’s time for all responsible Americans to join with the outraged students from Parkland. It’s time to show those heartbroken, articulate young people that they and their teachers matter, that the Sandy Hook children and their teachers and principal matter. It’s time to say that 239 school shootings since Sandy Hook in which 438 people were shot and 138 people killed is enough. It’s time to tell the world that the United States of America does, indeed, value everyone’s children. Please join Russ Walsh, me and educators everywhere to say that we, as a nation, will finally, at long last nurture all of our children. Come out with your neighbors, friends, and children and join the National Day of Action Against Gun Violence on April 20 (The anniversary of the Columbine shooting). A Minnesota school district is dropping two classic novels, “To Kill a Mockingbird” and “The Adventures of Huckleberry Finn,” from its required reading list because of the books’ liberal use of a racial slur. Officials at Duluth Public Schools say the move, which follows similar ones taken by other school districts in Virginia, Mississippi and Pennsylvania in recent years, was a response to complaints they had received in the past. The books are still available in libraries, and students can read them on their own time, but school officials will look at other novels on the same topic to add to its curriculum, Michael Cary, director of curriculum and instruction, told the Duluth News Tribune. “We felt that we could still teach the same standards and expectations through other novels that didn’t require students to feel humiliated or marginalized by the use of racial slurs,” Cary, who was not available for comment Wednesday, told the paper. 1. Of course, the N-word makes us all feel uncomfortable because it marginalizes people. That’s precisely why we should address that use of language: to see what’s beneath the use of that word and develop sensitivity about its use and the damage it causes. The N-word can be seen as what it is: just a word – not a good word or a bad word – but one that has power because of how it has been and currently is being used in our society. In The Adventures of Huckleberry Finn, the word was used because that’s how people of that time talked. In To Kill A Mockingbird, the use of that word showed how prejudiced, cruel characters talked. 2. In The Adventures of Huckleberry Finn, the moral center of the book is when Huck, who lives in a time and place in which African Americans are regarded as property and not as human beings, decides to treat a black man as an equal. Huck knows, from all that he has been taught by his church and his community, that he must turn in Jim, a runaway slave, so that Jim will be returned to his rightful owner, but he decides not to do that. Huck is sure what his consequence will be and says, “All right, then, I’ll go to hell.” He thought he would be condemned to hell for all eternity but could not do as his church and community dictated. He could not treat Jim as property. Why? Because he realized that Jim was his friend, his equal, not a possession. What better example of equity and dignity for all people, black and white, than The Adventures of Huckleberry Finn. 3. In To Kill A Mockingbird, Atticus, a lawyer in Alabama, takes a case that anyone else would regard as an open and shut case against a black man. A white woman accuses a black man, Tom Robinson, of making sexual advances to her. The all-white jury never doubted his guilt. No evidence was needed; his blackness condemned him. Atticus presented evidence to show Tom Robinson’s innocence and prevented the community from lynching him. Atticus taught his young daughter, whether it be Tom Robinson or Bo Radley, a white man in the community who was a social pariah because of his disabilities, that she should treat each person with respect, that each person has dignity. Atticus told her that she should try to understand what it’s like to walk in the shoes of others. The book offers a criticism of prejudice and of those who use the N-word. I have been a central office administrator who receives the complaints about books being used in the schools. Each complaint always began with these words: On page…., this was said or happened ” and “On this page, this was said or happened….. After the complaining person described precisely what had happened on those offending pages. I would ask the person this question, “Did you read the whole book?” Every time, the answer was “No”. I would then explain that reading the whole book would be a good idea. Objections to books, most often, result from not understanding the context of the objection. Michael Cary is wrong. It’s not about finding other books “on the topic” to add to the curriculum. Both The Adventures of Huckleberry Finn and To Kill A Mockingbird are works of art. They are not replicable. We study them not because they are about a “topic” but because they offer unique ways for students to question the human experience and to make sense of their own lives. The Adventures of Huckleberry Finn and To Kill A Mockingbird offer students what no other books ” on the topic” can possibly offer. If we didn’t have The Adventures of Huckleberry Finn and To Kill A Mockingbird, I would want to make them up. How else could we deal sensitively and poignantly with the fact that language can hurt people? How else could we bring up questions of what it means to be hero in our society which has questions of racism at its core? How else could we explore issues of racial prejudice? How else could we explore questions about an individual’s relationship to the norms of American society? How else could we explore questions of justice and human dignity in American society? These questions are best generated when students read these books as part of a class. Reading on one’s own never brings up as many questions and ideas as reading in a thoughtful way with other readers. Also, reading these books in class is the way to develop students into better, more mature readers. The Duluth Public Schools, which restricts students to reading these books on their own, stands in the way of the students’ growth as readers. The people complaining about The Adventures of Huckleberry Finn and To Kill A Mockingbird and the people who made the decision to remove the books should read the whole books. And then we’ll see what happens. Meanwhile, the rest of us not living in Duluth, Minnesota or in school districts in Virginia, Mississippi, and Pennsylvania who similarly banned those books had best make sure that our own children have the opportunity to read The Adventures of Huckleberry Finn and To Kill A Mockingbird, make sure that our own children are truly educated. Resist Now. In The Name Of Equity. Governor Malloy’s proposed budget gives a tax break to the rich. He advocates extending the 529 college savings plans, called CHET (Connecticut Higher Education Trust), to savings plans that can be used for K-12 education as well as college. As reported in the well-researched and comprehensive article in The CT Mirror by Jacqueline Rabe Thomas on January 16, 2018, the state currently allows parents to avoid paying state income taxes each year on up to $10,000 that they put into a college savings account. In addition, they don’t have to pay taxes on the earned income when the money is withdrawn to pay for college. Using 529 accounts to fund K-12 education in addition to college is part of the new Republican/Trump tax plan. States can go along with that tax plan or become decoupled from it. Governor Malloy has chosen to keep the state and federal tax plans coupled and go along with Donald Trump. The Connecticut General assembly will decide whether or not to go along with Dan Malloy. According to figures compiled for The Connecticut Mirror by the financial services company Vanguard, this is the picture for Connecticut families. Family A has a baby and, as soon as the baby is born, puts $200,000 into a 529 savings account for the future education of that baby. The family then withdraws $10,000 a year to pay for the child’s K-12 private school education. The family avoids paying $49,800 in federal taxes over the 13 years. At the end of the high school years, the family will have $382,000 in the account to pay for the child’s college education. Family B has a baby and, as soon as the baby is born, puts $66,000 into a 529 savings account for the future education of the baby. The family withdraws $10,000 a year to pay for the child’s private school K-12 education. The family avoids paying $18,200 in federal taxes over the 13 years. But the family will have no money left in the account to pay for college. Family C has a baby and does not have any money to deposit in a chunk to a 529 savings account at the baby’s birth but saves what it can over the following 18 years for college expenses. All savings are needed for college; there is no money available for private K-12 education. There, probably, is not enough to fully fund college education. Family D has a baby and has no ability to save in any way for college. So the only people who will profit from the plan that Governor Malloy is proposing are the very wealthy, only those who qualify as Family A. Donald Trump’s tax plan and Dan Malloy’s budget proposal have no benefit for Family B, Family C, and Family D.
The gap between the haves and the have-nots widens. The rich get richer and the poor stay poor – and the middle class struggles. And here’s the real kicker: The rest of us will pay for that tax break for the rich. The Governor’s Office of Policy and Management estimates that 529 plans for K-12 education will cost the state $39 million per year. We barely have enough money to keep the lights on in the state, yet the Governor is asking all of the citizens in Connecticut to fund this substantial tax break for its wealthiest citizens. There will be less money available to fund public schools, especially those in high poverty areas that depend on state funding, because of the added strain on the state budget caused by the state supporting the extension of the 529 savings plans to K-12 education. The access to private school will not be extended to middle income families. In Connecticut, private high schools cost day students between $43,600 and $48,080 for tuition alone. Catholic high school tuition is between $14,300 and $19,800 per year. Private elementary schools cost over $40,000 per year, and Catholic elementary schools charge about $8,000 for tuition. Middle income families cannot fund a private K-12 education; it is clearly an option for only the wealthy The total cost of a private K-12 education in Connecticut is between $260,000 and $570.000. Even an education at a local K-8 parochial school and a regional Catholic high school costs between $130,000 and $150,000. Paying for any of these schools is out of reach for middle-income families who are saving for college. So those who claims that Donald Trump’s tax plan and Governor Malloy’s proposal is extending school choice to anyone other than the incredibly affluent are not realistic. In fact, they are wrong. Lastly, there are questions about exclusion of students based on sexual orientation and learning disabilities in non-public schools. Some religious schools have been found to be discriminatory concerning the sexual orientation and life style of their employees. A case about that kind of discrimination in a Connecticut school is currently in the courts. State funds should not support schools that do not meet state standards for anti-discrimination. Connecticut has excellent public schools. Connecticut also has a problem with poverty. State funds are best directed to address the underlying causes of poverty which inhibit the learning potential of children mired in poverty rather than give tax beaks to those who already can afford private schools. Call your state legislator (https://www.cga.ct.gov/asp/menu/cgafindleg.asp) and tell him or her to reject the Trump and Malloy proposal. Tell your state legislator to reject the extension of the 529 college savings accounts to 529 savings accounts for K-12 education. Tell your legislator that having 529 savings accounts for K-12 education is unfair, undemocratic, and fiscally irresponsible. Then call your state legislator again, saying the same thing.